The design for this galaxy has been made by Astroluma. Star 1: "The Gateway Crisis"
And with that, Mario must venture to the brown side of the planet, and talk to the other Luma waiting there. “The comet observatory’s up ahead!’ he says, transforming into a launch star, “I wonder what its doing here?” Mario then hops in, and blasts off not only toward the next segment, but also towards a new cosmic adventure. The next segment takes place on the comet observatory. Our hero touches down near the holographic map, and a fuming Gearmo is there to great him. “The shields are down!” he says, glowering at Mario, “and enemies seem to think they can just waltz right on in! Worse still, that darn Bowser stole all of out Power Stars! Without them, the Grand Star Drive won’t come back online, and we’re sitting ducks to anything that wants to attack us! I can’t believe this!” after the angry robot has had his say, Polari Speaks up. “We just got word from some of Lubba’s Lumas, and they think he might have been kidnapped by Pee Wee piranha! To reach him, you’re going to need a launch star, so see if you can find any star chips!” following his advice, Mario sets off to locate the star chips. However, the Gearmo wasn’t lying about the enemies. While on his hunt, Mario must avoid Goombas, Piranha Plants, Mini Goombas, a few sentry beams, and Octoombas. 1: over by the red luma, were the crystallized red star used to be. 2: close to the kitchen, near the entryway. Back flip off of the ground. 4. Near the gate, over by were the hungry Luma used to be. 5. On the very top of the observatory. To reach it, Mario must navigate through a series of cloud platforms, while avoiding a few Paragoombas. “The teleprocess are malfunctioning, but the raised pressure on the observatory’s inner mechanics has caused the engine to release massive amounts of water moisture!” a yellow Luma floating next to the red Luma says, “maybe you could walk on it using the cloud flower to get to the out-of-reach star chips!” Mario finds that this is not only possible, but also necessary to reach the higher levels, as the teleported are indeed offline. However, that’s not the only thing that’s broken. The protective barrier that prevents Mario from falling off the edge of the observatory is also malfunctioning, so if he slips up, he’s a goner. The objective of this segment is pretty clear. To locate the right Goomba and stop it flat, while avoiding other enemies such as one banzai bill, a few Octoombas, and one more sentry beam. Wooden bridges connect the ships, and Mario must rush across them in order to reach the next craft. This next segment is the second to last. It takes place on a chain of four duplicates of the gateway galaxy planet with the meteors peppering the surface. The objective here is to simply get to the end, were another launch star waits. Enemies on these planets only include a few Goombas, but the constant stream of meteors is what makes this section difficult. Get hit once, and Mario has a good chance of being flung into one of the black holes resting in each planets center. A shop Luma can be found near the launch star, offering a choice of useful power-ups in exchange for a few of the starbits strewn about the level. Once Mario has picked a mushroom and stepped into the launch star, he is blasted towards the final segment, the gateway to the starry skies. As he is flying towards this nostalgic planet, Mario can already notice some significant differences. One, the egg of Pee Wee Piranha rests right in his path, and two, Lubba is trapped in trapped inside a force field! In order to free his friend, Mario must defeat Pee Wee Piranha for a second time. This is not hard, and before long, the force field holding the round Luma disintegrates, and Lubba and the power star next to him are set free. So, disobeying the Gearmo’s not-so-kind advice, Mario ventures to the dirt side of the disk-like planet, and is greeted by a yellow luma, and two red topmen spawned from wormholes. “I wouldn’t use this if I were you.” He says, gesturing towards the malfunctioning launch star, “it doesn’t go anywhere, so you‘ll just get blasted off into space.” Mario follows the launch star’s path with his eyes, and finds that the luma is right. The translucent blue beam just ends in mid-air far away, next to a lone sky-ship. However, if Mario’s going to get his hands on the galaxy’s third power star, he’s going to have to take risks, so, with a determined expression on his face, he hops into the launch star and blasts off into open space. Mattermouths are the only enemies that can be found on the top die of the disk-like planet, the portals popping up in their wake leading to an unforgiving black hole. After the two Octoombas have been either spun or stomped, the caged vanishes and the luma breathes a sigh of freedom. “Thanks!” he says, “here, you look like you need a sling star, so I’ll just transform!” with that, the luma shape-shifts into a much-needed sling star, leading towards the nearby sky ship next to the one the flew forth from the portal. Once there, Mario finds two Mattermouths chomping through the ship’s deck in a circle, another black hole waiting at the other end of the portals popping up behind them. Luckily, these hazards are easily avoided, and before long, the circle of portals behind him, he comes across a familiar sight, a cannon. However, it looks as though, similar to the launch star, this cannon leads nowhere. But, Mario figures that this is just another risk he is going to have to take, and hops in. To his surprise, six more ships fly out of portals, creating the next segment. Aiming his targeting symbol at the closest ship, he discovers a metal pole topped with a pull star, reminiscent of Bowser Jr.’s airship armada, and with a tap of the A button, Mario goes flying towards it. Grabbing the blue gimmick to prevent him from rocketing out into empty space for the second time today, Mario drops down on the top of the pole, and is immediately charged at by a Goomba. Stomping this pest flat as he hops off of the pole, our hero touches down on the flying boat’s purple grille, Cosmic clones immediately springing up behind him, and finds a flip switch, the goal of this segment then becoming clear. Mario must locate the red Ground-pound switch, give the button a good stomp, collect the cloud flower that appears on the ships deck near the front, and then run over the flip-switch, turning the blue panel yellow. He must then use the cloud-flower to hop across the large gap between wormhole ships, locate the flip switch on each one, and turn it yellow, while avoiding Mattermouths, red Topmen spawned from wormholes, Goombas, and the clones giving chase. There are seven ships total, a deactivated flip-switch, and a cloud flower on each one. After all seven gimmicks have been turned on, the annoying cosmic clones on Mario’s tail disappear, and a launch star appears on top of a pole near the back of the last ship. Avoiding the two Mattermouths chomping in a circle, Mario hops on the pole, climbs to the top, and flips into the launch star, rocketing off towards the next segment, the grassy disk planet with the tilted cubes strewn above its upper hemisphere found in SMG1 right before Mario faces King Kaliente. Chomps roll forth from the large hole in the camouflage painted machine, and are smashed to bits by an iron pillar jutting out of the bottom side of the planet. Bullet bills are also fired, and they fly forth from the small holes near the top of the steel structure. Several large silver UFO planets fly high above the grassy side, but since the planets have no gravity, they are just for looks and are impossible to reach. Mario touches down on the steel side of the planet, and is greeted by a luma. “Those stupid Bullet Bills smashed up my launch star, so if you see any star chips, grab em’!” he says, “and watch out for those creepy Dinosaur Skulls!” following the Luma’s instructions, Mario immediately spies the first star chip. This is the only one found on the industrial steel side, and to secure the other four, he must venture to the populated gassy side, avoiding the Mattermouths the luma mentioned that circle the equator, leaving a string of deadly gateways in their path. The strange UFO planets floating above this planets elliptical surface pose no threat to our hero, and they must simply be ignored. 1: near the luma, on the bottom side. 2: close by to the base of the metal tower. Bullet bills are very common here, so Mario must watch his back when hunting for this chip. 3: on top of the tower, in the center the flat roof encaged inside a glass dome. To reach this chip, Mario must get one of the many bullet bills found here to follow him and shatter the cage. 4: on top of one of the large tilted yellow blocks scattered around the grassy side, guarded by a Mattermouth and an Octoomba. 5. On top of another yellow block, near the tower. This chip is unguarded, and it is the easy to obtain. 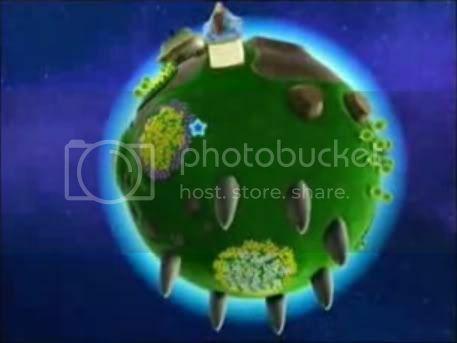 After all five pieces of the Lumas damaged launch star have been collected, the gimmick appears on the bottom side, near were Mario originally touched down, leading to the second-to-last segment, a duplicate of the last planet in the “Storming the sky fleet” stage. At first glance the planet appears rather empty. But, as soon as he lands, three red topmen pop out of wormholes, and rush at him! Running from these pests, Mario also notices that the planets banzai bill launchers are still working, and he must avoid these as well. The goal here is relatively the same as last time. Mario must travel towards the end of the planet with the spiny piranha plant, although this time, the overgrown weed is gone, and in its place, a ground-pound witch rests, circled by two angry Mattermouths eager to see Mario fall through one of their deadly portals. After the witch had been stomped, a launch star appears were the power star in the cage used to be. “Well, there’s no power star here.” Another toad standing by the new launch star says, “and I wouldn’t use this thing if I were you, it just leads out into open air.” Well, throughout this level Mario has learned that things are not always as they seem, so, ignoring the toad, he hops into the launch star and blasts off into space. Thankfully, sure enough, a sky ship flies out of a portal right in front of his path a few seconds before Mario falls to his death. Landing once again on the ship’s purple grill, Mario enters the last segment. To his delight, it appears as though the toads were wrong. There is a power star to be found here, and it’s resting in a cage right next to where he lands! But unfortunately, there are no enemies on the ship, and no keys in sight, so how is Mario going to open the cage and get the power star? Well, it might have something to do with the currently dormant yellow moving platform found next to the side of the ship. Upon stepping on said platform, the gimmick comes to live with a lurch, pulling Mario slowly into the final segment, and small rectangular floating maze made out of horizontally placed enlarged wooden block things that block your progress originally featured in Cloudy Court Galaxy. The wooden platforms are too high for Mario to jump over, but also do not hinder the yellow platform’s movement, so if Mario isn’t careful, the metal floor will fly right out from under him. While running quickly through the maze, Mario must avoid the occasional bullet bill blasted at him from one of the few floating bullet bill launchers placed high above the maze. No other enemies can be found here. Luma on top of house says: Whoa you found me! Take this gift! (gives 1-up) But get back to saving the power stars! Luma Says: The comet observatory’s up ahead! I wonder what its doing here? Luma transforms into a launch star and shoots mario towards the observatory. Located on top of the bedroom. Left Luma: Our teleporters aren't working use this cloud flower to get higher up. I think I saw a star chip up there. Right Luma: Shake the wii remote to make a cloud to jump on. Luma says: Look I found the star chip. I saw one further up though, use this cloud flower to get up, but beware of paragoombas. Avoid the paragoombas and then the launch star appears where you landed. Just wanted to show you what it has on it. There is another ship connected by a bridge with a banzai bill going across the bridge. On the other ship a goomba holds the key to the luma's cage. Luma says: Those Jerks threw me in here and took the key!Let me out of here! After Freeing him: Thanks! It was starting to get a little stuffy in there. The Luma turns into a launch star and you blast off to the next segments. Mario must navigate these planets to get to the launch star at the end while avoiding meteors. At the bottom stone structure lies Pee-Wee Piranha's Egg and at the top (where you meet Rosalina) is Lubba trapped in a force field. Defeat Pee-Wee Piranha to get your star and save Lubba.